Just by hearing the name you can already probably imagine what a kitchen with White Ice granite countertops would look like. 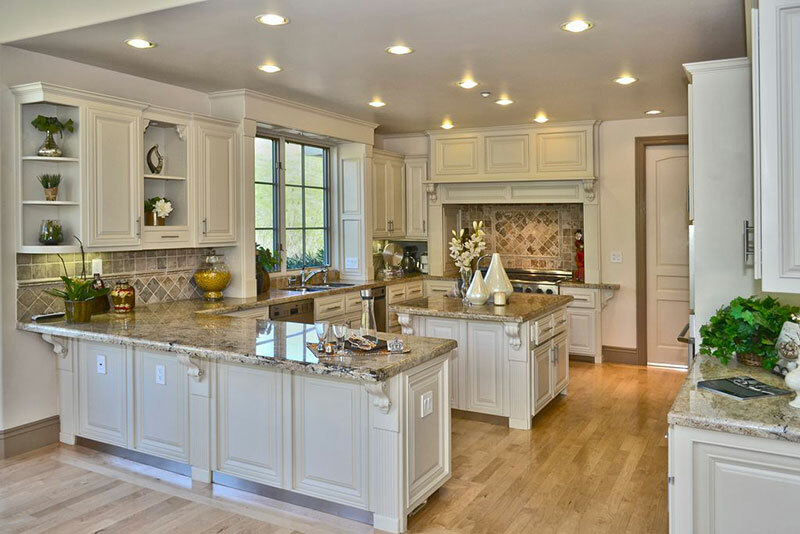 It’s one of the most sought after types of granite for a very good reason. 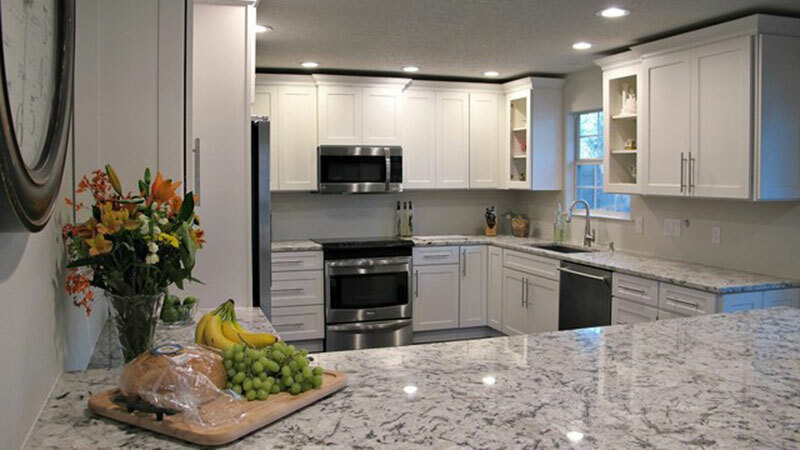 What Is White Ice Granite? White Ice Granite is quarried in multiple quantities from several different quarries in Brazil which are all located in the same small area. It is known for being a reasonably delicate granite that does need a little bit of care and attention. Because of this fragility, White Ice granite is mainly advised for use in kitchen countertops instead of flooring or bathrooms. 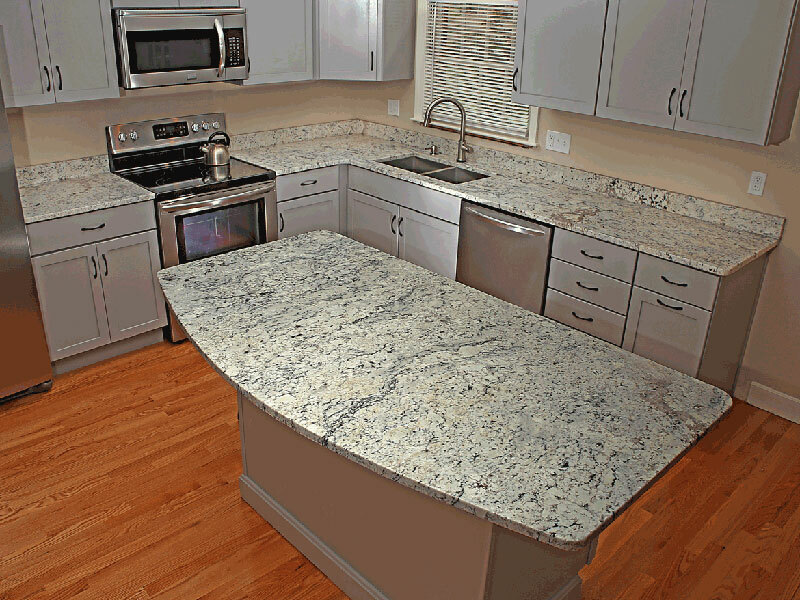 White Ice granite is scratch resistant, but it is prone to staining and in some cases heat damage. It is important that you do not leave liquids on White Ice granite countertops for long periods of time – especially acidic ones like orange or lemon juice. (It’s not a huge emergency if you do spill something on them because it takes a little time for the staining to occur – just clean the liquid up as soon as possible). The one saving grace of this beautiful stone is that naturally it has swirling patterns and any minor staining that does occur will be usually well hidden within the natural patterns. 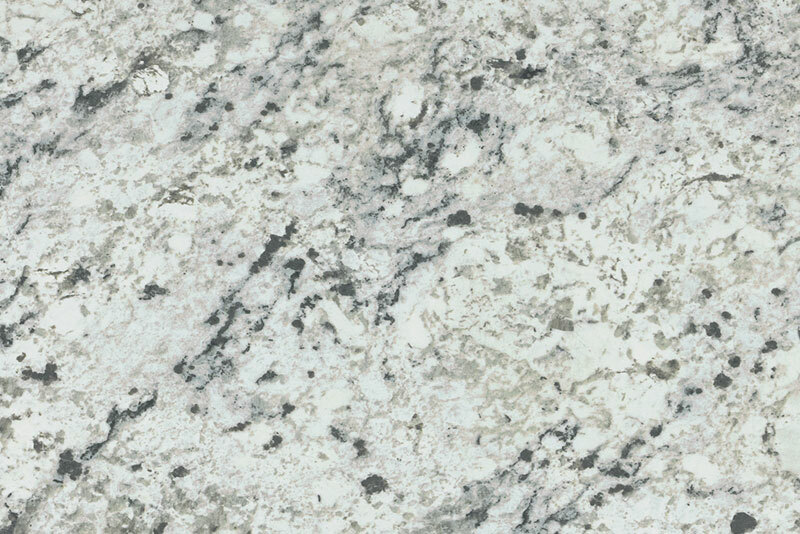 What Color Is White Ice Granite? White Ice granite is a predominantly white stone (as you might have guessed from the name!) The pristine white bedrock is intertwined with gray swirls that are found in various shades from deep and dark through to almost white. The gray and white combination is visible from afar, and the granite does not have a uniform appearance regardless of distance. There are occasionally very small reflective mineral deposits within the stone that can sparkle when the light hits them – but they are not very common. It will just catch your eye from time to time, instead of looking like a disco ball. 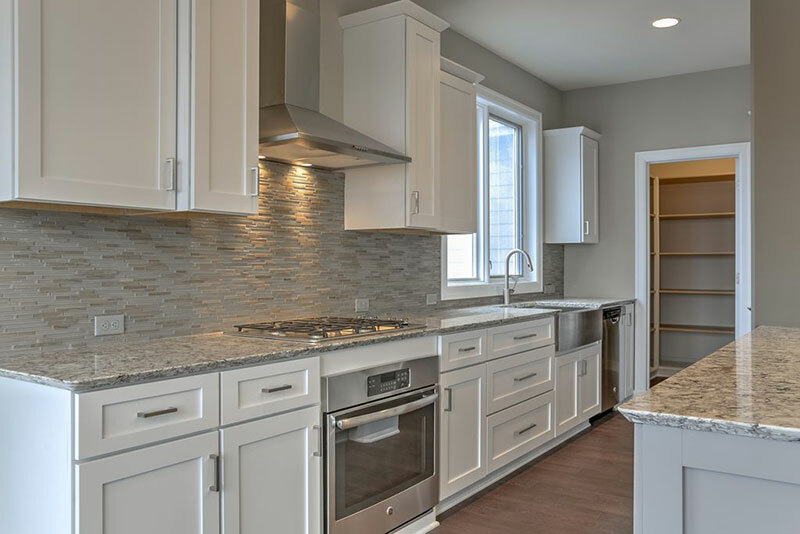 What Cabinet Colors Go Well With White Ice Granite? 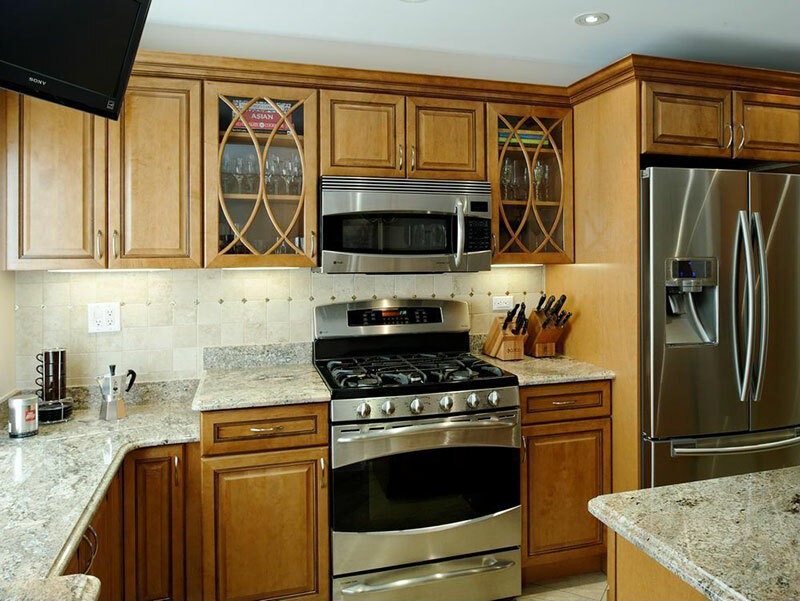 What makes this granite so popular is the wide range of different cabinet colors that it can complement with ease. It is one of the most versatile granites when it comes to décor. When you combine white ice granite with white cabinets, the kitchen takes on a very soft and minimalistic feel. 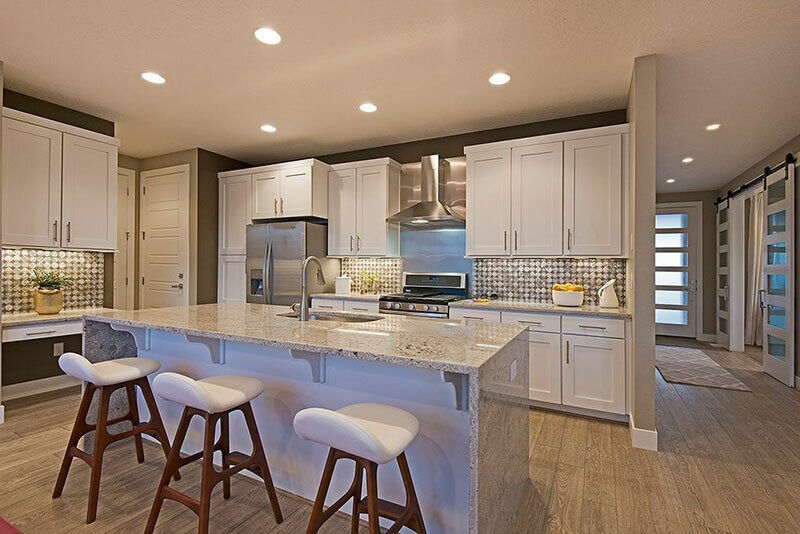 Normally white cabinets and white countertops are a combination that could leave a room feeling cold and a little clinical – but this is not the case with white ice. The stunning gray streaks and swirls that run through it ensure the white is softened and creates a stunning effect. 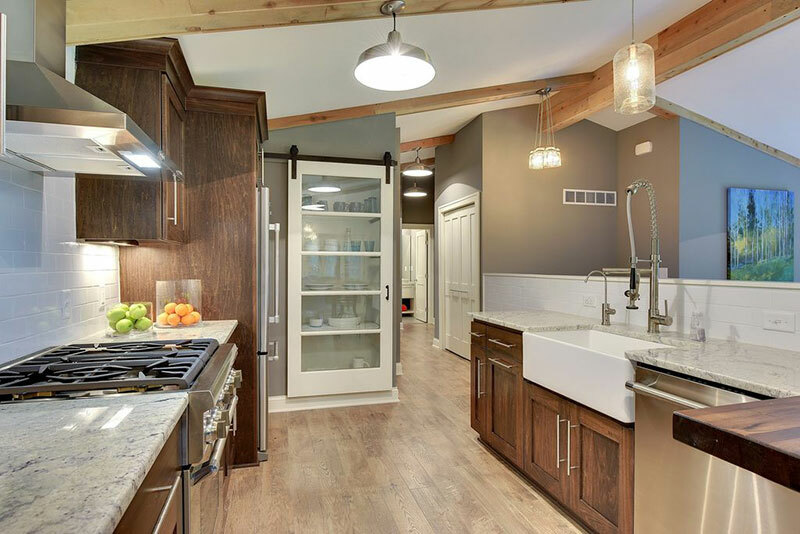 You might expect that when you combine White Ice granite with cabinets that are non-white, the contrast could be overpowering – but this is not the case. 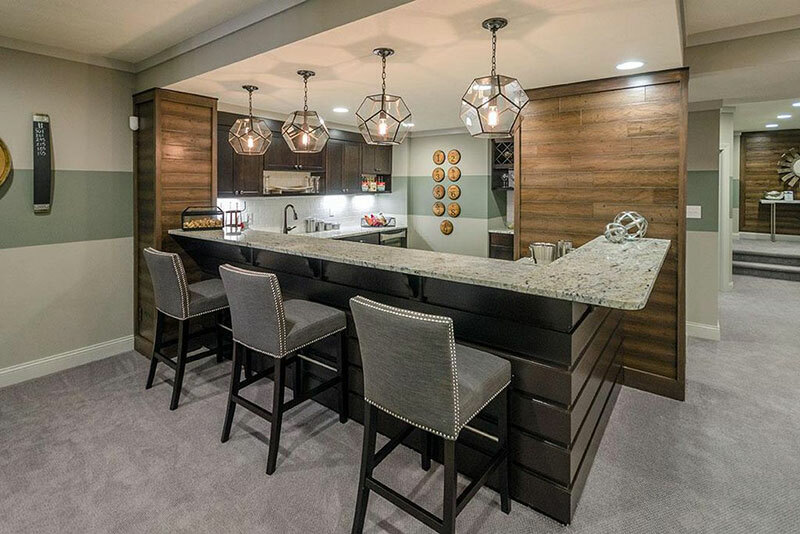 With natural wood stained cabinets the contrast between the light brown of the natural wood and the stark white bedrock of the granite is softened by the gray minerals. It is still quite a striking color combination, but it is not as dramatic as you may originally think. (But if you want it to be a little more striking try and find a slab that has fewer grey minerals. Granite is a natural resource, and different slabs of the same kind of granite can look very different). 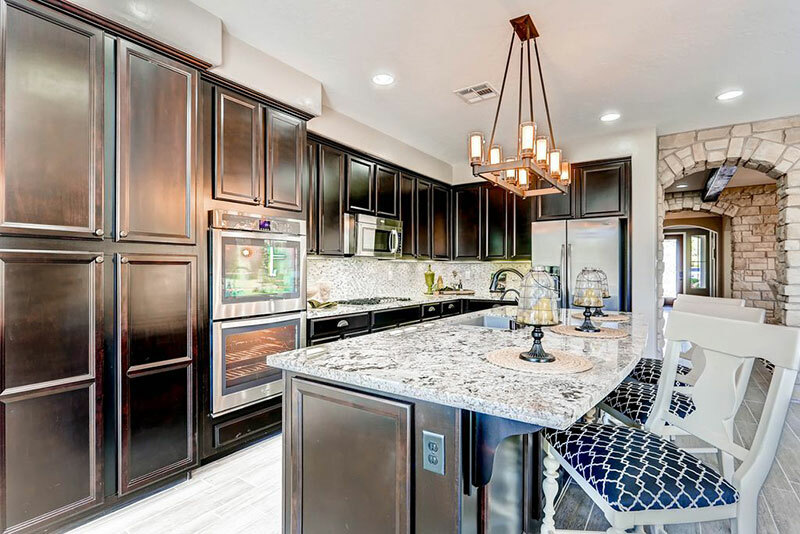 With dark brown cabinets, the contrast is obviously the strongest it can be. It creates quite a distinguished feel to the room. This color combination feels very mature and refined as opposed to exciting and adventurous. 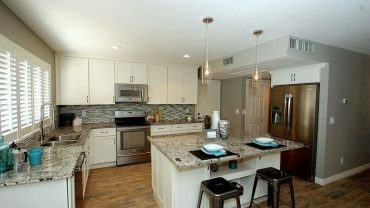 Again, the gray saves the day and ensures the contrast is not too harsh between the cabinets and your countertops. 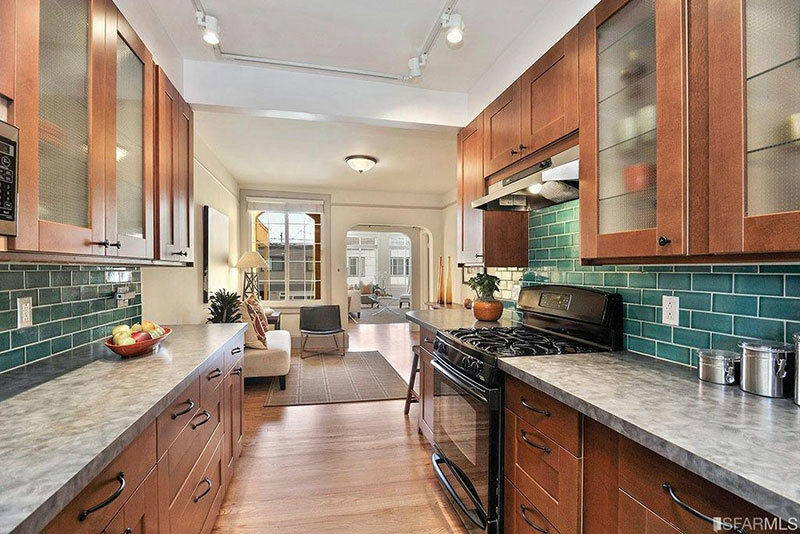 How Much Do White Ice Granite Countertops Cost? 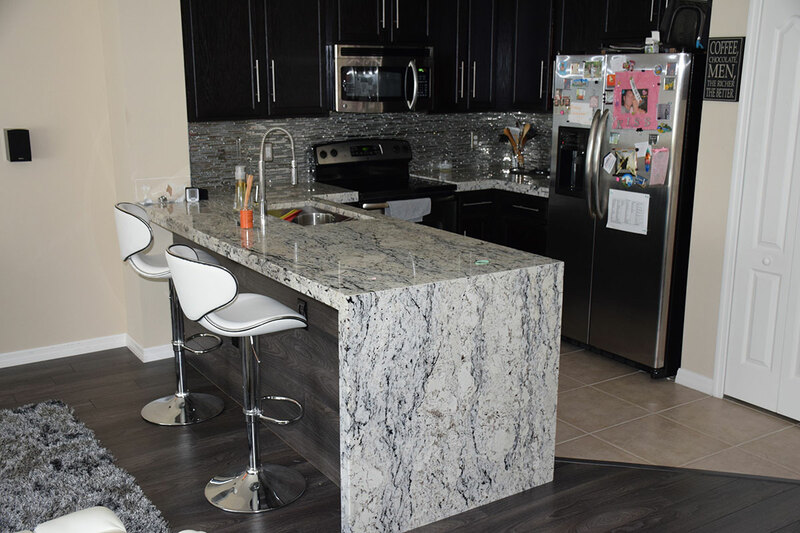 White ice granite countertops are in high demand, and they are only found in a limited amount of quarries and is, therefore, a premium product. It is priced around $400 – $600 per square meter. An excellent premium stone that needs a little bit of care and attention. But if you look after it, White Ice granite countertops can totally transform the look of your kitchen into a thing of beauty.